The First Discussion at the 107th Session of the International Labour Conference (ILC) adopted proposed Conclusion with a view to a Convention, and had started the discussion on the proposed Conclusions with a view to a Recommendation. Domestic Workers were back at the ILO Shaping International Labor Standard to Stop Violence and Harassment in the World of Work. The ILC convened its 107th session in Geneva from May 28th to June 9th. 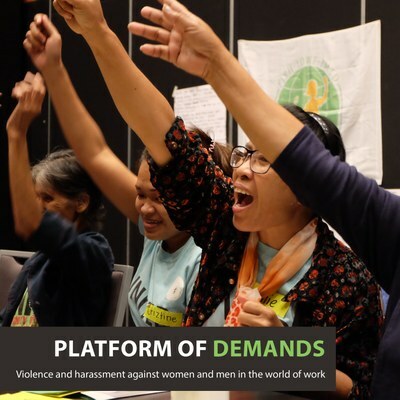 Around 5,000 delegates representing governments, workers, employers and non-governmental organizations sectors from around the world gathered to discuss and debate the creation of an instrument that will address the pervasive problem of violence and harassment in the World of Work. Domestic workers’ voices were strong and present in the debate. 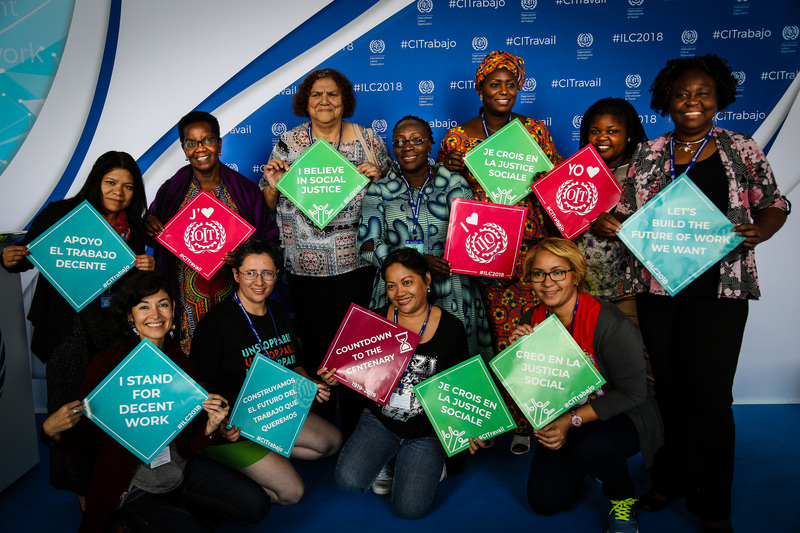 IDWF had a 15-strong delegation of domestic workers and other leaders of their organizations from Africa, Asia, Latin America, North America, and the Caribbean. “We, domestic workers are back again, this time for another ILO Convention to protect us against violence and harassment in the workplace. The invisible violence that we must bear in our work places as women and as workers is one of the most pervasive injustices inflicted into our sector but we are here to make sure this will come to an end”, said Myrtle Witbooi, President of IDWF and leader of the delegation. Our federation has been working and preparing for this International Labour Conference for over two years. Among its strategic actions in 2017-2018 IDWF surveyed its affiliates to understand the national situations. During April and May of this year, affiliates from Africa to Asia, to Europe and the Americas and the Caribbean regions gathered at regional workshops to share stories, discuss strategies and plan for actions to tackle this issue in their countries, and at international level. Specifically, to the ILO process, it documented responses from its affiliates in reply to the ILO Questionnaires. As a result of these consultations, IDWF has produced a “Platform of Demands” featuring the issues domestic workers deem most vital in this discussion. Informal Sector Workers Speaking One Voice at the ILC. In this ILC session we partnered with our allies from WIEGO, StreetNet, HomeNet and IUF to have a united and stronger voice representing the informal sector workers such as waste-pickers, street vendors, home-based workers and domestic workers. Informal workers have been our long-time allies and friends in the struggle for decent work; together we joined efforts to strategically bring the voices and experiences of one of the most marginalized workers and therefore most at risk of violence, harassment, abuse and intimidation. The accounts described by our affiliates and allies across these sectors tells us about the urgent need to address pervasive issues that render workers vulnerable to incidents of violence at the workplace such as lack of recognition, protection, and access to justice. For more read WIEGO’s Violence and Informal Work briefing note. Our Delegation Leading with Courage, Strength and Strategy at the ILC. During the conference our delegation played an important role as they skillfully and relentlessly navigated different levels of political advocacy influencing opinions and shaping debates inside their national trade union delegations, their government representatives as well as in the international trade union arena. Our leaders handed out our Platform of Demands and submitted our amendments proposal to the Workers Groups. 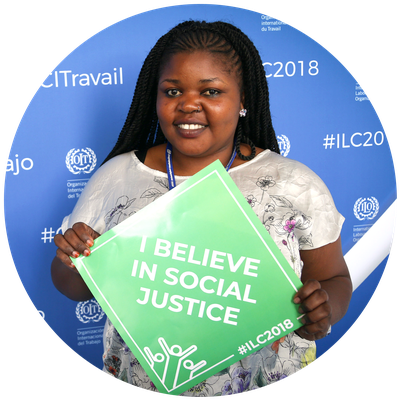 Please listen here the speech of our president Myrtle Witbooi during ILC plenary session; check the interviews with our leaders from SINACTTRAHO-Mexico, Marcelina Butista, and Zainab Ecumba from KUDHEIHA-Kenya and visit our photo gallery to have a sense of the activities performed by our delegation. Our ExCo members and regional coordinators also played a key role in networking and advocating international labour policy makers, the ITUC and other regional and national allies to further advance the agenda of decent work, violence and harassment-free workplaces for domestic workers among other priorities. At first I didn’t understand anything. Especially with the presentation of the employers. Bit by bit, I started to internalize the process and so with the topics. I started to do my part – to look for our country representatives. I met with my government representative. I was excited about telling our stories to them. Heated discussions went on between the government, employers and workers. I observed supportive governments, as well as those opposing the convention. I wonder why some governments did not defend workers when their migrant workers abroad are the most vulnerable. What I’ve learned is that I need to read more about the legislation. 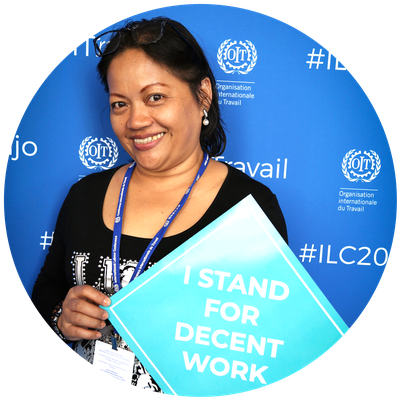 Participating in this year’s International Labour Conference in Geneva was great for me as a migrant domestic worker. I was able to experience firsthand information on how people come up with a Convention and meet important leaders in various sectors, who otherwise I would have never met in my life […]. ILC brought all the relevant people that I have been longing to meet and discuss the issues of migrant domestic workers. It was particularly important getting to meet our Secretary General of COTU brother Francis Atwoli and being able to explain to him the need for ratification of C189 in Kenya. Being in the committee for violence and discrimination in the place of work, helped me to demystify on when to know that you are being violated at your work place and the kind of environment that’s ideal for all workers not just domestic workers. 1) team work. 2) the orientation and daily preparatory meetings with our allies WIEGO, StreetNet, HomeNet, and IUF, 3) the debates in the workers’ group, 4) debates in plenary and 5) the alliances. All these points were of great relevance since it helped us have clarity on the process. Another interesting part was to see how governments express themselves in groups, as is the case of GRULA (Latin America and Caribbean) the European group, and the African group that when one spoke was speaking as of group or regions not as individual countries. 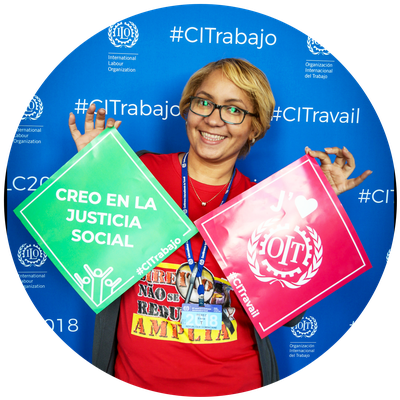 […] This great experience also gives us a great opportunity because now we have a year to work lobbying our countries for the adoption of a Convention to guarantee world of work free of violence. I believe that if we continue working together as one single body we will win! The Battle of Negotiations: Wins and Challenges at the ILC. Discussing and debating for first time at the ILO standard-setting process was NOT an easy process as many employers did NOT want a mandatory instrument expressed during the debates of the tripartite commission. Yet despites the challenges and thanks to a great deal of lobbying efforts the major victory was an agreement to get a Convention supplemented by a Recommendation. We were very happy to see how the adoption of C189 in 2011 has paved the road for this convention and raised so much awareness and concerns to stop violence and harassment in the world of work. On the flip side one of the major losses we had from the workers’ sides was the removal of a list of workers who are disproportionally affected by violence and harassment because of their sexual and gender orientation such as the LGTBQI community. With a very heavy heart the workers’ group had compromised on this point as there was strong opposition from quite a few government groups and employers. There was no agreement on definitions and terminology. Our main challenges ahead for 2019 are basically to educate our government officials to understand the day-to-day dynamics and risks faced by workers in the informal economy because of lack of protection, and effective access to justice. Planning next steps to work on 2018-2019. IDWF will continue to organizing, mobilizing and strategizing in the different levels and arenas of action. Intense lobbying at local level with our governments and with our trade unions will be key aspects of our work until 2019. Starting with online evaluation and debriefing sessions with our leaders at regional level in order to have a collective understanding of what exactly lies ahead of us. At national and local level we’ll continue supporting and leading advocacy campaigns in at least 2 countries per region. In September IDWF will also join the ITUC in their debriefing and strategizing sessions to be part of global advocacy efforts. Our first strategy session workshop on GVB will take place during our second Congress in Cape Town, South Africa in November. Please stay tuned, plug-in and keep your warrior spirit up until we win this fight! Stop Gender Based Violence and Support the ILO Convention!